Wed., Dec. 5, 2018, 8:43 a.m.
A social-media savvy criminal is in jail after his promises to police on Facebook to turn himself in went viral. Last week, as part of “Wanted Wednesday,” Richland police asked for the public’s help in finding Anthony Akers. Akers, 38, was wanted by the state Department of Corrections for failing to comply with the terms of a sentence. He is a regular at Benton County Superior Court with a history of illegally possessing prescription drugs, resisting arrest and violating protection orders. 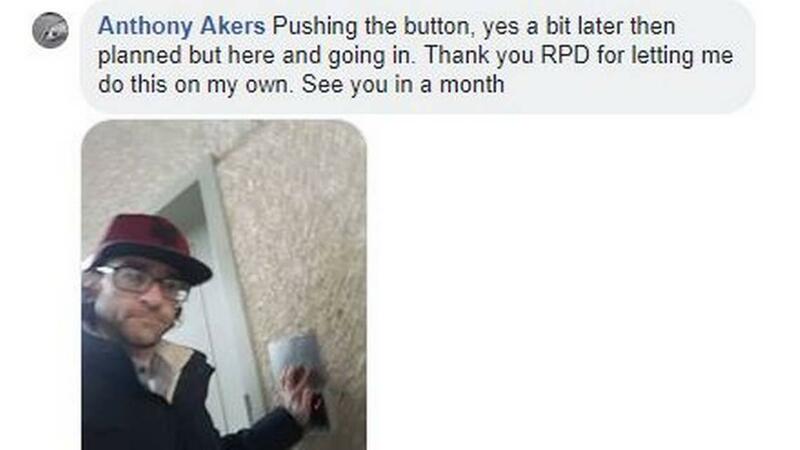 It took just over five hours for Akers to contact Richland police on Facebook, telling them he was going to turn himself in. When he didn’t show, Richland police reached out again. This time Akers said he was trying to tie up some loose ends before being locked up, but promised to be at the station within 48 hours. Richland police responded Monday with their own post asking for the public’s help finding the wayward Akers. This time the department made a plea for Akers to stop breaking his promises. By the time Akers turned himself in at 3:29 p.m. Tuesday, his exchange with Richland police had more than 850 reactions and hundreds of replies. Published: Dec. 5, 2018, 8:43 a.m.